For your photo page. This is a picture of "Engine Co. No. 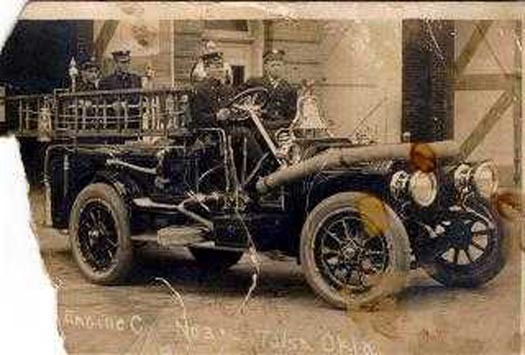 3, Tulsa, OK." There was no date on this photo, however, I have talked to some vintage auto buffs and opinion is this is about a 1924 or 25 model Oldsmobile. I am told they typically had bigger type balloon tires, but you might want to compare to what else you have or ask another opinion. This photo was in a box of old photos belonging to my great-grandpa's, Oscar McCoy, wife. I believe a relative of our family worked at one time for the trolley company and then the fire department. Still checking that out. I don't know if I can get a better copy, but can ask the owner to loan it to me if you want to try and make it look better, should you decide to use it. Thanks again for linking my webpage to your site.